Discussion in 'Updates & Changelogs' started by Ryvirath, Nov 11, 2018. On Wednesday, November 14th, Grepolis will be updated to version 2.176. As always there will be a short downtime while the update is applied. This version brings a useful timer to World Wonder screens as well as a new hero with a special new ability. World Wonders - We have added a timer to the World Wonder construction site screen, and the World Wonder alliance screen. This timer will count down to the beginning of the Age of World Wonders, once the world has reached the requirements for World Wonders to begin. 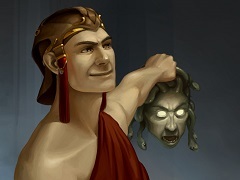 Hero - A new hero was added to the game - Perseus. Perseus is a new exclusive hero that becomes available with the next in-game event. Effect: When Perseus fights against all mythical units, their attacking and defensive values are decreased by 5%. Awards - "Stopping Colony Ships" and "Intercepted Colony Ships" awards will now have a red banner in the background, to keep the award consistent with other similar rewards. Beginners protection - Beginners protection shield should always be removed when sending an attack. Agora - Using "Return all units" button will now refresh the units list.